In public, couple matching is commonly frowned upon or considered "gross." Well, unless you're at the Kentucky Derby, that is. Take a look at the 13 cutest couple outfits at the Kentucky Derby, because coordinating with your S.O. isn't always lame. But beware, these photos might give you some serious #relationshipgoals. 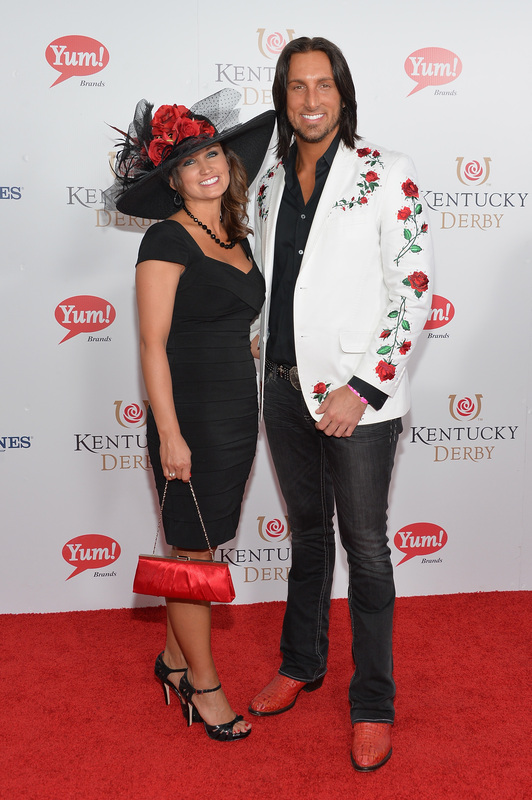 At the Kentucky Derby, it seems like all bets are off when it comes to fashion rules. Suddenly, it's totally acceptable to pair the craziest hat with the brightest dress you can find, layer on all the prints your heart desires, and actually end up on the Best Dressed List. And, while couple matching hasn't been cool since middle school (no, not even for Halloween), the Kentucky Derby definitely allows for some wiggle room on that front. Whether you wear different versions of the same outfit or simply color coordinate, you don't have to worry about being judged by onlookers when everyone else is dressed just as crazily. I'd advice you to take advantage of this opportunity — it only comes once a year. Not all of these celeb couples matched identically, but they looked great together at previous Derbys. Whether you're going to the horse race with your boyfriend or best friend, or watching the action at home in matching pajamas (which is the right way to do the Derby, IMO), get some major style inspiration from these adorable pairs. The outfits aren't identical, but they used flowers — aka, the most important part of any Derby outfit — to indicate they were a team. Adorbs. If you're going to wear all white to a horse race (WHY?? ), at least do it together. Not only is it great these two are wearing the exact same dresses, but they wore such classic colors! I could see this look working long after the Derby ends. I'll admit, I am not sure if this is a father/daughter pair or if he's just the ultimate babysitter, but this is the cutest thing I've seen all day. If you want to match each other, but don't want to go as far wearing identical outfits, try inverting each other's colors. It's cute enough to send the "coordinated" message, but not over the top. I love that the pastel colors of her dress perfectly vibe with the shades used in his bright suit. Her dress and his pocket handkerchief are just similar enough in color to send the "we came here together" message loud and clear. I bet these two had no trouble finding each other in the crowd! Normally, wearing the same hat or outfit as someone else is a fashion no-no. But at the Derby, anything is possible. Kris and Kim look elegantly sophisticated together. They played it safe as far as Derby fashion goes, but they played it safe together. Those peacock feathers on either outfit would definitely be hard to miss. He definitely let her take the spotlight by wearing the same colors that were on her dress, but totally downplaying his suit. What a gent. These two completely rocked their printed suits. Dying.